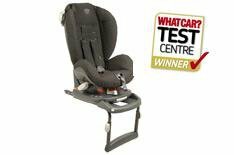 7th Mamas and Papas Pro-Tec Isofix 150 | What Car? This seat feels well padded and the covers for the harness straps are comfortable. The deep seat design includes a headrest to closely surround your child and their head. There are four recline positions, which can you can select with handles on either side of the seat. It's an easy job, but a front-seat passenger might not be able to reach the handle easily. The Isofix version of the Pro-Tec is easy to fix, besides the usual bulk of a seat of this size. However, we found the pinch release mechanism for the catches stiff and a little awkward to use. The seatbelt has a long and rather convoluted journey around the Pro-Tec, but there aren't any tight spots to feed the belt though and a tension device ensures a very secure fit. While there are only three different height positions for the harness, it's very easy to make the adjustment. Isofix solutions don't come cheap: you can save a little with a Google search, although you'll still be shelling out more than 200. The maxim that you get what you pay for rings true here, with all of the materials used feeling of the highest quality. An excellent seat, but there are no unusual tricks to shout about.